First Baptist Church is a body of believers whose goal is to influence our church and our community to LOVE GOD and LOVE PEOPLE! Check out our Children's Ministry Page for information on all things Children at FBC! We at First Baptist would love to have you join us, and we want to be as welcoming as possible! You can visit our What To Expect page to get more info on what visiting our church will look like. Stay up to date with the happenings of First Baptist Church Long Prairie by visiting our Updates page. You'll find information such as announcements, new events, and this weeks bulletin. This Saturday's Worship Night (4/20) is being postponed due to the Easter Holiday weekend and other commitments for those who would normally support and attend this event. 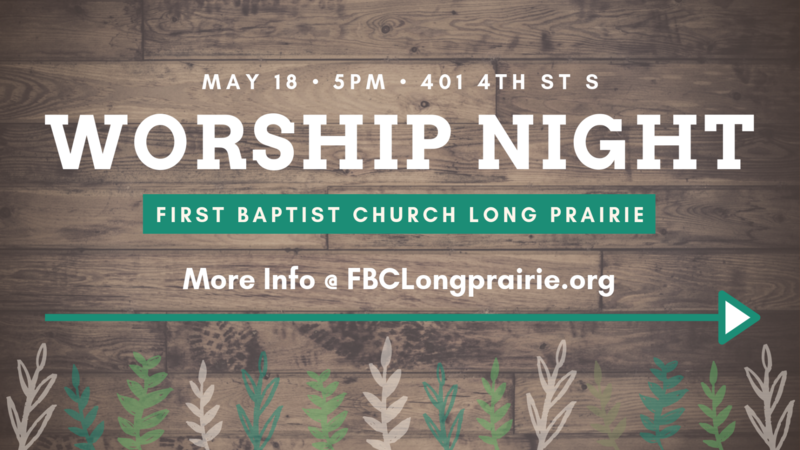 Our next Worship Night will be Saturday May 18th at 5pm. If you have any questions or are interested in volunteering at this event please contact Jackson. We at FBC invite you to worship with us! No matter where you are at on life’s journey, you are welcome here! Looking for a specific page? Check the Navigation Menu at the top of you screen. Here are a couple quick links to some of the different pages we hope that you will check out! Listen to This Week's Sermon!